Did You Sign Up for A Birthday Card? 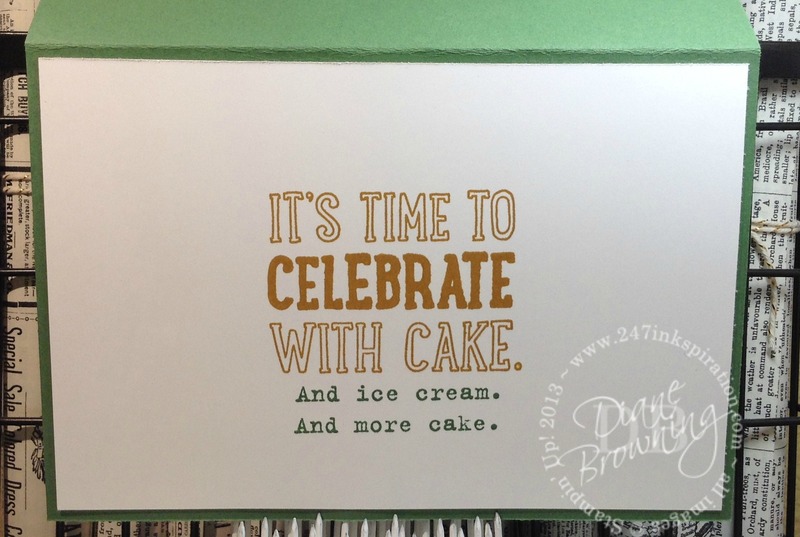 A few weeks ago, I mentioned that Stampin Up was promoting getting back into the habit of mailing birthday cards (you can read that post here). It kind of seems like an obvious thing, considering we are in the business of promoting hand made cards. I know I’m guilty of doing the quickie FB “happy birthday” greeting like so many others and very few cards actually get mailed out. In honor of Stampin Up pushing promoting birthday cards, I invited you to send me your birthdate and your contact info so I could send a birthday card to you. You can email me your info if you prefer not to post it in the comments. On the subject of birthdays, my friend Poli just had a milestone birthday. I’ll spare revealing how old, but as she says herself – it’s just a number. I love her positive attitude that “everyday is a gift”. And it truly is. Everyday is a gift. We should all make the most of the days we have. Poli is a big fan of the stamp company Heartfelt Creations so I had to make her card using their products. Yes, I do use non-Stampin Up products on occasion. 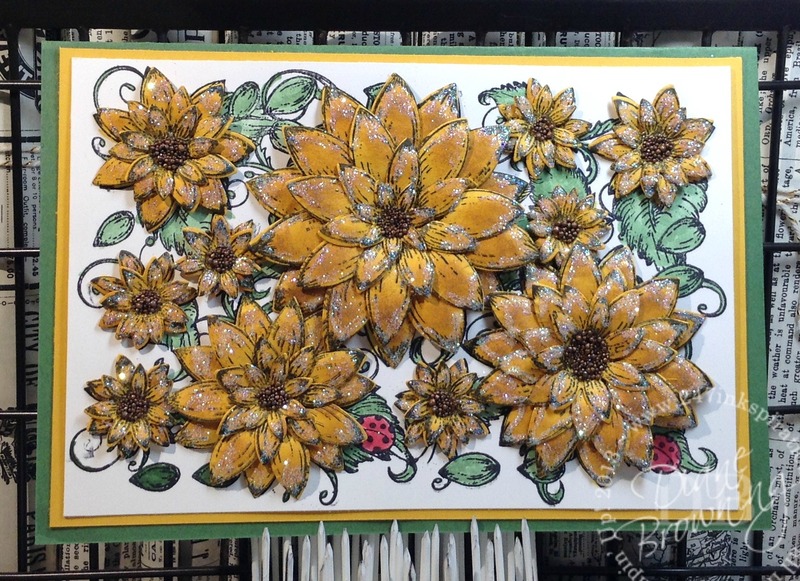 I had a sunflower background stamp and die set. I stamped the background once on Whisper White, then several times on Crushed Curry card stock. I colored in the background stamp on the Whisper White. Then die cut all of the Crushed Curry flowers, then inked them with Delightful Dijon. Using the Heartfelt Creations Flower Shaper kit, I shaped the flower (it’s a process). Once I had the flowers shaped, I glued several layers together and then glued them to the background on the Whisper White. After I had the flowers set on the background, I added a light glue to all the petals and added our Dazzling Diamonds glitter. Once that was dry, I dumped off the excess glitter. Then I added glue to the center of all the flowers and added “Prills”. These are microbeads that Heartfelt Creations sells to use for the center of flowers. It gives it a more realistic look than just plain card stock. Here’s the final card. Some of the flowers have 5 or 6 layers. Like I said, it’s a process. The overall effect when it’s all put together is amazing! This is truly one of a kind card, just like Poli is one of a kind! And yes, the card ended up bigger than any envelope I have in stock and I ran out of time to make my own. Oh well. She didn’t seem to mind that there was no envelope. This is the inside of the card. If you’re interested in Heartfelt Creations, just google them. I found them a Scrapbook Expo, but I’m pretty sure you can find them locally or online. Check back for Wednesday’s post where I’ll be sharing some info from OnStage last week!